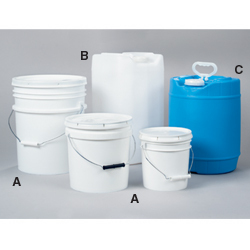 Tough, high-density polyethylene pails are ideal for storing a wide range of hazardous and non hazardous materials. Rust- and corrosion-resistant. Open head pails nest for convenient storage and have metal swing handles for easy transport. Closed head pails include lift-up plastic handles, superior neck finish, and self-draining tops for convenient stacking. Material has been approved to meet FDA standards. Order in quantities of 4, priced each. IN STOCK. Conforms to item 258c of the NMFC and Rule 40, Sec. 7.25 of the UFC without cover, and to UN reg. 1H2 with cover. YA-0280 5-gal. capacity. Wt. 2 lbs. Color: white. YA-0281 Wt. 1/2 lb. Color: white.